Ipomoea aquatica is kangkong in the Philippines, kangkung in Indonesia and Malaysia, Rau Muong in Vietnam, pak bong in Laos and trakuon in Cambodia. It's English names include water or swamp spinach. It is not kale nor is it related to kale. Neither is it related to spinach. Water spinach is a semi-aquatic plant that thrives with little or no supervision. 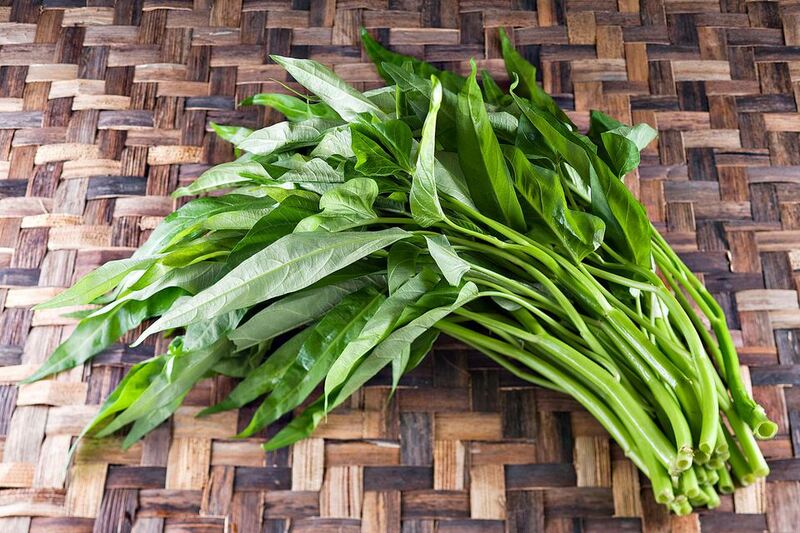 In fact, it grows so fast that it is considered invasive in some regions, but in Southeast Asia where it is used to cook a myriad of dishes, water spinach is never invasive. On the contrary, it is considered a culinary blessing because it is easy to grow in abundance and is, therefore, sold very cheaply. There are many sub-varieties of water spinach; some are shorter than others and the leaves are of different lengths and shapes. All, however, have hollow stalks from which the leaves grow. Both stalks and leaves are eaten. Water spinach is used in stir-fried dishes or added to soups. Because it is difficult to determine the sanitary condition of the water in which the vegetable grew, it is not a good idea to eat water spinach without cooking it first. To prepare water spinach for cooking, rinse very well to remove any sand or grit trapped in the stalks and leaves. Cut off the discard two to three inches off the bottom of the stalks. This portion is too tough and fibrous. After discarding the unwanted parts, take the bunch of water spinach and cut them into halves horizontally. The lower half, consisting mainly of the stalk, will require a longer cooking time so it is best to separate this portion from the leafy and more tender upper half. Cut the water spinach into the size required by the dish. In most cases, water spinach is cut into two-inch lengths but that is a matter of practice rather than a strict rule. Whether including the water spinach in a stir-fry or a soup, remember to add the bottom half to the pan or pot about three to five minutes ahead of the upper half. This will ensure that by the time the leafy upper part is done, the lower half will be cooked just right. Add the lower stalks too early and they will be soggy by the time the leaves and tender stalks are done. Add them too late and they will still be tough by the time the leaves are cooked through. It may take a little practice to find the right interval between the addition of the lower and upper halves of the water spinach to the pot but, once you get the hang of it, you will be able to enjoy water spinach cooked just right.